Seventy awards and $4,000 in scholarships and prizes were presented to Manor FFA members Thursday night during the organization’s 55th Annual Awards Banquet, held in the Penn Manor High School cafeteria. In her keynote speech, Manor FFA alumna Victoria Herr encouraged members to look beyond themselves to achieve the goals they may be afraid to reach. A 2014 Penn Manor High School graduate, Victoria is serving as State FFA Secretary. 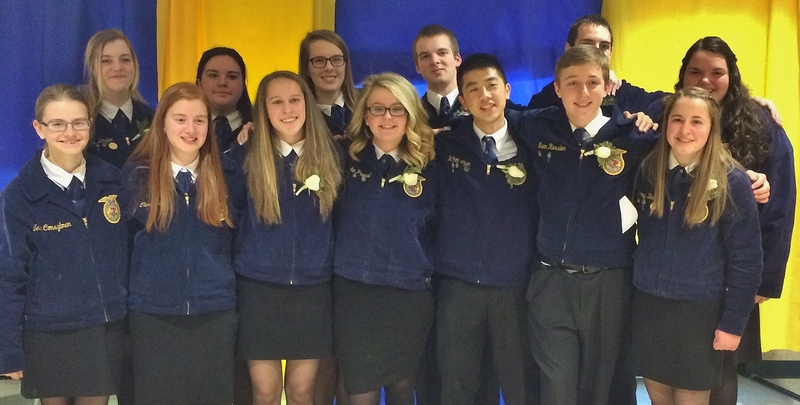 The 2015-2016 Manor FFA officers were installed at the banquet. They include Neve Consylman, Cheyanne Ditzler, Clara Hess, Rose Drumm, Katey Bleacher, Ellie Barley, Brooke Pannell, Wesley Herr, Nathan Phan, Evan Ressler, Justin High, Sammy Bleacher and Sam Garrett. Leadership Award Winners were honored. They include Cheyanne Ditzler, Humanitarian Award; Ellie Barley, Outstanding Interview; Katey Bleacher, Outstanding Contributor; Wayne Rineer, Most Improved Senior; Katelyn Campion, Dekalb Award; and Collin Bitts, Birchler Award. Proficiency Award winners also were announced. They include: Emily Witmer, Goat Production; Joel Burkholder, Dairy Production Placement; Neve Consylman, Agricultural Education and Vegetable Production; Ellie Barley, Grain Production Placement; Katelyn Bleacher, Poultry Production; Cheyanne Ditzler, Equine Science; Emily Alexander, Small Animal Science; Nate Phan, Ag Sales; Jonah Barley, Dairy Production Entrepreneurship; Katelyn Campion, Swine Production Entrepreneurship; Cody Martin, Diversified Crop Placement; and Rose Drumm, Beef Production Entrepreneurship. Congratulations to all who received honors. Proficiency Award Winners, from left: Emily Witmer, Joel Burkholder, Neve Consylman, Ellie Barley, Katelyn Bleacher, Cheyanne Ditzler, Emily Alexander, Nate Phan, Jonah Barley, Katelyn Campion, Cody Martin and Rose Drumm. 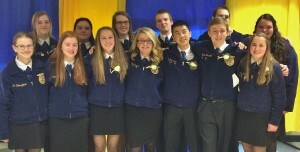 2015-2016 Manor FFA officers, from left: Neve Consylman, Cheyanne Ditzler, Clara Hess, Rose Drumm, Katey Bleacher, Ellie Barley, Brooke Pannell, Wesley Herr, Nathan Phan, Evan Ressler, Justin High, Sammy Bleacher and Sam Garrett. Leadership Award Winners, from left: Cheyanne Ditzler, Humanitarian Award; Ellie Barley, Outstanding Interview; Katey Bleacher, Outstanding Contributor; Wayne Rineer, Most Improved Senior; Katelyn Campion, Dekalb Award; and Collin Bitts, Birchler Award.